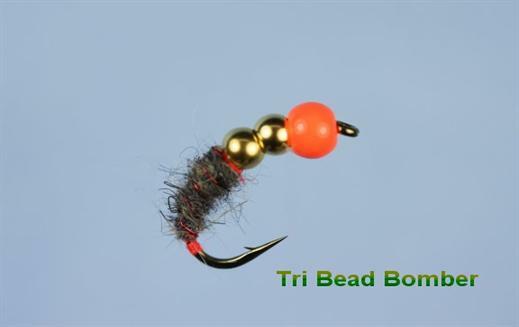 The Tri Bead Bomber is a devastatingly effective fly. It is very useful and productive when fishing in tumbling water and is weighty enough to quickly get down to the feeding channel where trout must react quickly or tasty morsels such as a well presented attractor nymph will be swept past. It is an extremely versatile heavy nymph that is successful throughout the year. It is ideal in cold spring waters, through the warm summer days when the fish often drop down, also for autumn trout and later for winter Grayling. Currently there are no comments about the Tri Bead Bomber fly pattern from other fly fishermen yet.